The 70-year-old retired civilian staffer at the Defense Department is a registered Democrat in suburban Denver who prides herself on not blindly voting for her party. She’s regularly voted for Coffman, welcoming his moderate stance on immigration and his military service record. But Coffman’s streak with Bazel has run out thanks to President Donald Trump. The congressman may differ with Trump sometimes, but Bazel yearns for Democrats to control the House so they can launch investigations and provide a check on the president. “I just feel like we’ve got to have a change to get rid of this awful person, before our democracy is destroyed,” Bazel said, referring to Trump. If there are enough Mary Bazels here and in suburban congressional districts across the country, Democrats could be well on their way to gaining the 23 seats they need to flip control of the House. It’s a reversal of fortune for lawmakers like Coffman, whose occasional bucking of the GOP has long been a selling point to voters. But in the partisan turmoil of the Trump era, it could turn into a vulnerability if voters in critical swing districts reject anyone with an R by their name to send a message to the president. Even some Republicans are concerned. As his district grew more Democratic over the years, Coffman kept winning. An Army and Marine veteran who served in both Iraq wars, Coffman initially was elected to a comfortably Republican district in 2008. But just before the 2012 elections, his district shifted to one evenly divided between Democrats, Republicans and voters who don’t register with either party. Once a supporter of legislation that would allow English-only ballots, Coffman learned Spanish, softened on immigration and became a fixture at Ethiopian church services, Hindu festivals and Salvadoran celebrations in his new district, where 1 in every 5 residents was born in another country. Coffman comfortably beat back three Democratic challenges — debating one opponent in Spanish — even as his district leaned more and more to the left. In 2016, as Hillary Clinton won the district by 9 percentage points, Coffman ran ads promising to oppose her and Trump. Coffman won by 8 points. Now he’s fighting for his political life against Democrat Jason Crow, himself a former Army Ranger. 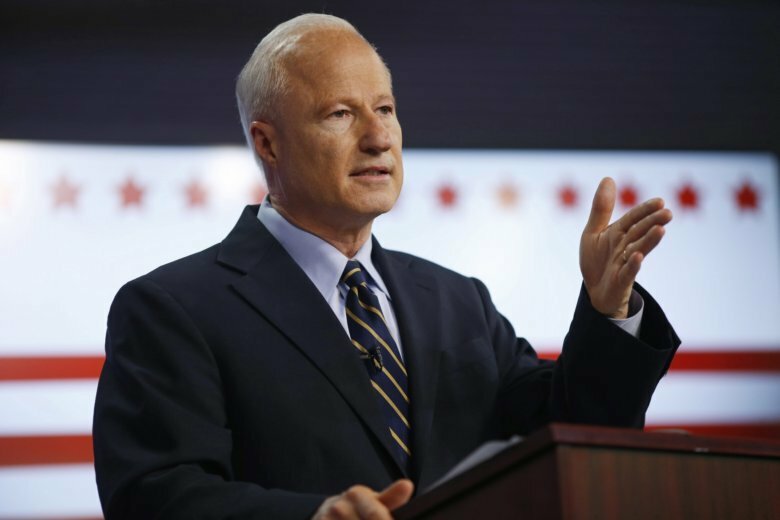 Coffman’s being outspent nearly 3-1 on the airwaves as gun control groups pour in money and hope to make an example of the Republican and his pro-gun stance in a district that includes the site of the Aurora theater shooting and abuts Columbine High School. The financial picture got grimmer last week when the political group tied to House GOP leadership canceled $1 million in ads they had planned to air to support Coffman. The congressional arm of the GOP is trying to help by increasing its ad spending by $270,000. His work ethic is legendary — he’s been videotaped doing push-ups while waiting at the Denver airport for his flight to Washington, and is notorious for burning through staff with his nonstop schedule. He contends he’s better prepared for a Democratic wave because he’s used to fighting uphill re-election battles, unlike some other House members who could be caught by surprise. Coffman acknowledges he’s at a new disadvantage now because of all the Democratic money targeting him, but dismissed their attacks tying him to Trump. “I work with this administration when I agree with them and I stand up to them when I don’t agree with them,” Coffman said. Though Coffman has voted for some GOP priorities like the recent tax bill, he highlights when he disagrees with the administration. He sponsored a bill to restore net neutrality after the administration revoked it and voted against the final bill to roll back President Barack Obama’s health care plan. He’s criticized Trump for using a vulgarity to describe immigrants from some African countries, for separating families that cross the border and for ending an Obama administration program to prevent deportation of people brought to the U.S. illegally. It’s the last issue that Democrats frequently highlight to argue that Republicans like Coffman are all talk. Coffman and other moderates vowed to defy their own leadership in the House, executing a parliamentary maneuver to force a vote on legislation to provide legal residency to people brought to the country illegally as children after Trump rescinded the program that prevented their deportation, known as DACA. The bill would have passed the House on a bipartisan vote, but in the end the moderates withdrew it as part of a deal with GOP leadership. To Democrats, it’s an example that, as long as Coffman lets Republican leaders control which bills get voted on in the House — and the committees that would otherwise investigate the president — what he says doesn’t matter. That’s the theme of the Democratic House campaign operation’s first television ad against Coffman, which quotes him promising to stand up to Trump and then says he’s voted with the president 96 percent of the time. The statistic is from the political website 538. Coffman says it’s misleading, but Republicans used a similar percentage from the same site in 2014 as the centerpiece of their campaign to oust Democratic Sen. Mark Udall for voting too often with Obama. Ruth Gonce, 63, is a Democrat who never was won over by Coffman. “He’s very good at standing up there with an immigrant and saying, ‘I’m for these people,’ and then he goes back to Washington and he votes with Trump,” the retired real estate agent said as she waited at the Crow event. Coffman’s hope is there are enough people left like Neb Asfaw, an Ethiopian-American community organizer and active Democrat who accompanied the congressman at the religious festival and still supports him because of his service to the community.